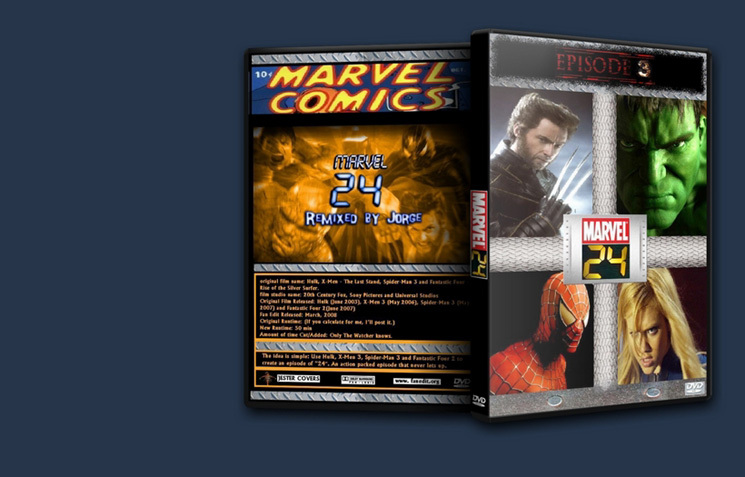 Hulk, X-Men 3, Spider-Man 3 and Fantastic Four 2 all in one episode of marvel24. No, well maybe more like a Rogue Thought: Make a Marvel Universe movie. You can follow the progression of this idea from its inception on February 13 to its completion on March 20. 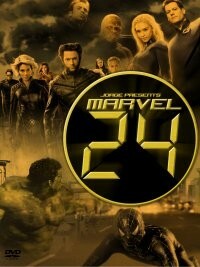 The idea is simple: Use Hulk, X-Men 3, Spider-Man 3 and Fantastic Four 2 to create an episode of “24″. An action packed episode that never lets up. I decided to start with the ending and work backwards to the beginning. So this is EPISODE 3: 8pm to 8am. Winner of the FE cover art contest. As a parody of 24, it's pretty solid. Obviously the gimmicks are used way more in the show than in this fanedit, in particular the time clock flashing, the split screens, the ticking clock noise. Up to the last 10-15 minutes, I was kind of wondering what the point of it was, sure it was edited awesomely and in the intense breakneck style of 24. But it wasn't really making me see these things in a new light, it was just making the climaxes to three very unenjoyable sequels more exciting than they had any right to be, which itself is a feat. But honestly I never felt the action was an issue (at least with X-3 and Spiderman 3, I abhor the FF movies). 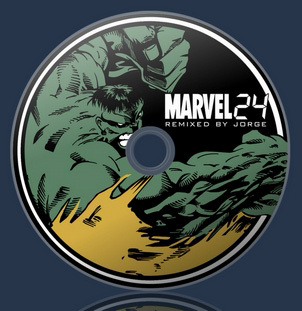 That was untill I hit the ending, matter of fact the ending was the best part, as the poignant moments overlap each other, the thematic relevance across all of them is shown (using silver surfer voice over to show this awesomely). In particular, the split screens are used to great effect for the more poignant moments at the end, showing the fallen heroes at the end. Only after seeing the ending, it felt like it fit and I really appreciated it as a whole. There's very little you can do about taking three very separate movies and making an overlying story narrative, so I'm not going to give you grief on that, although there's glimpses of trying and it's intriguing to think about the nature of Galactus as a global threat affecting all these other situations, it doesn't really pull through in the end. Nonetheless, thematically, you hit the nail on the head, it's about sacrifice and making the right choice and I loved that you were able to cleverly show that here. On the other hand, you captured the spirit of superhero comics, they all have their own separate books and dealing with their own situations in their own little corners of the universe (that they all share), and you really show that here and get the excitement of reading multiple characters that usually would have nothing to do with each other. There's a couple of things, yes, you're trying to make it seem like these happen concurrently and I get that, but if time passes on one end, time should pass in another movie. It was most noticeable to me as Sandman was pounding on Spidey while Venom held Spidey down. You cut to another film during the pounding and you cut back, and Spidey is still getting pounded, so he was just getting pounded the entire time? It's one of the biggest issues that bothered me. I also would have liked to see more clock, I know it didn't test well and it haunted you after the fact. I'm just saying. Overall it's very enjoyable edit.